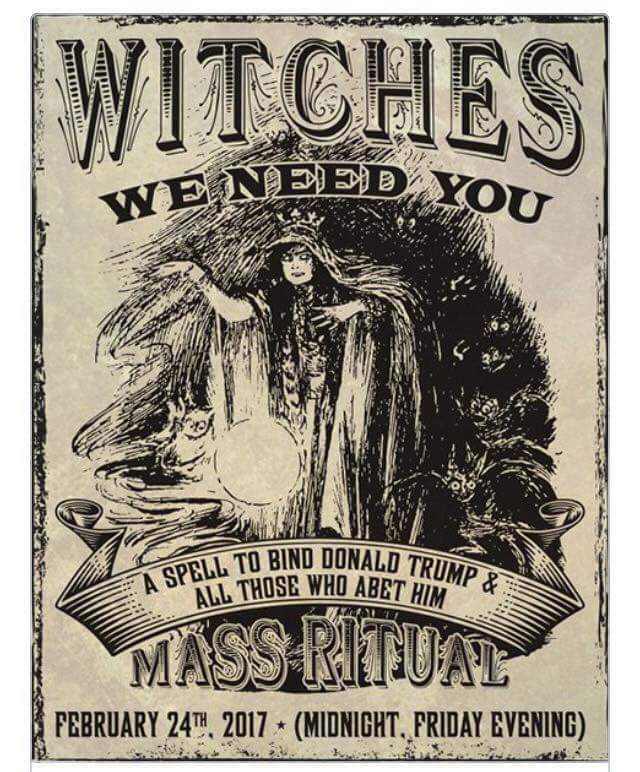 So today (February 24th, 2017) is the day that witches across the United States are going to hex Trump. Its really strange being I just did a write up a few weeks ago on the connection to the three witches “mythology in movies” to three modern day witches. And now this. 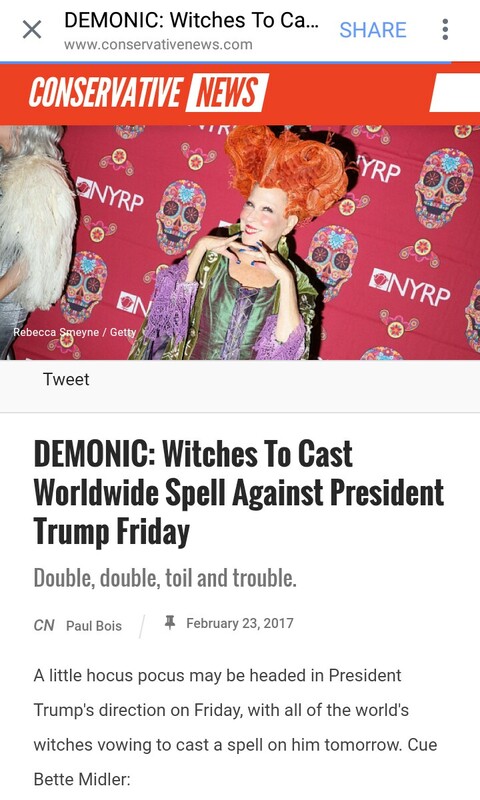 A mass movement of feminist witches cursing Trump (http://www.conservativenews.com/article/1374/witches-cast-worldwide-spell-against?utm_source=facebook&utm_medium=social&utm_content=062316-news&utm_campaign=benshapiro). Notice there picture that they used. You can read my article here (https://m.facebook.com/story.phpstory_fbid=1110194012423483&id=519754571467433). Now today (Friday 2/24/17) is the day before St. Walpurgis Day. This isn’t to be confused with Walpurgis Night that coincides with May 1st. Tomorrow (2/25/17) is celebrating Saint Walpurgis’ death in 777 (some argue its 779) in Heidenheim, Bavaria. Now its interesting that they use the day before the anniversary of her death in 777 and the Jewish year is 5777. Probably just a coincidence right? Actually according to the flyer for the event it takes place at midnight. That’s actually the 25th in our American thinking. If I say Friday at midnight then that really means 12am Saturday. Walpurgis is invoked as special patroness against hydrophobia, and in storms, and also by sailors. Hydrophobi is a year of water and the disease of rabies in humans. Makes sense that she is invoked ay a time when the Oroville d is about ready to break now isn’t it? She was also the abbess (sounds like abyss), “unities of nuns following the Benedictine Rule, of convents of the Second Order of St. Francis (Poor Clares), and of certain communities of canonesses.” (Encyclopedia Britannica). So Walpurgis was the head and rule over not only mind but monks following the Benedictine Rule. Now here is the interesting thing about this order. The monks who kept this Benedictine Rule (https://en.m.wikipedia.org/wiki/Rule_of_Saint_Benedict) were called Trappist. 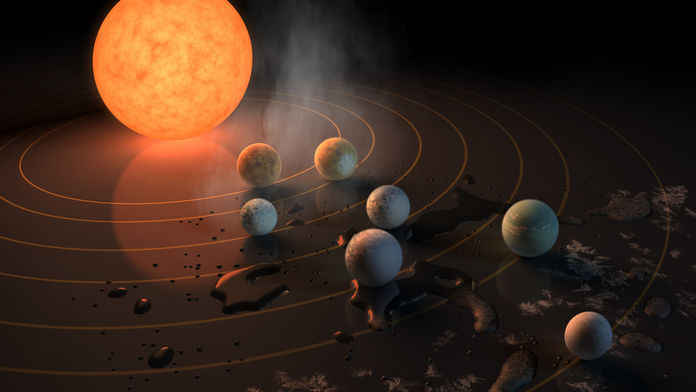 NASA came out a few days ago announcing that they had found a dwarf star that had seven planets that were the size of earth surrounding it and this star was called Trappist 1 (https://www.nasa.gov/press-release/nasa-telescope-reveals-largest-batch-of-earth-size-habitable-zone-planets-around). They say THREE of the SEVEN are habitable that are in the constellation Aquarius. Aquarius represents the dawn of the golden age or the new age. 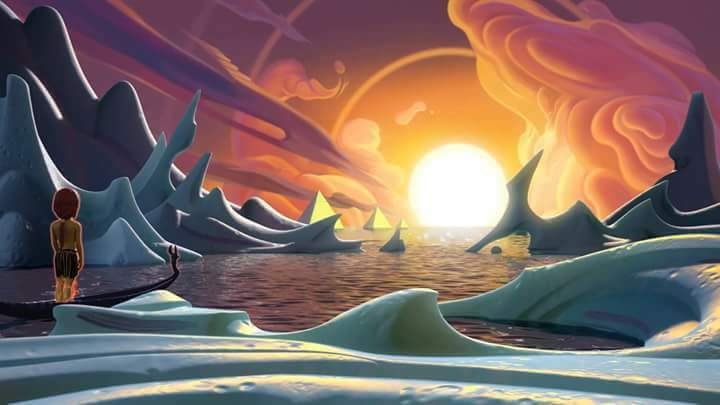 Now what caught my attention was that these seven new planets that NASA believes has life on it, were reminding me of the Pleiades or seven sisters. Pleiades is in the neck of the bull Taurus and these seven sisters are waiting to enter into this Age of Aquarius or new age. And these seven sisters were companions with Artemis or Venus. And I should also mention that the I Pet Goat II video at the end has this false Roman Catholic looking christ has the bleeding heart (in this case on fire), riding in the Styx boat passing through the waters into this new age of Aquarius. 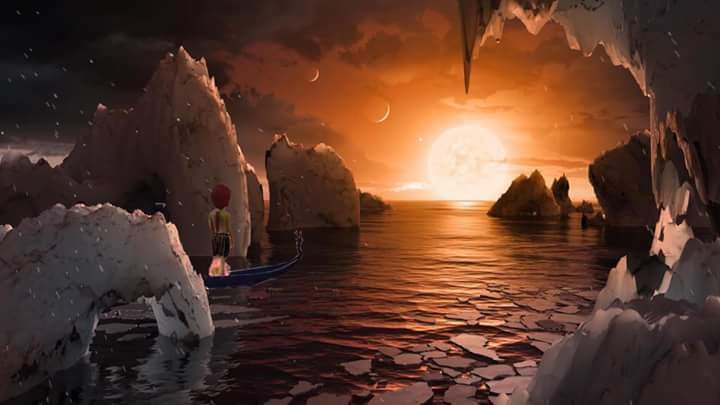 And looking at the screenshot of this video to what NASA released as looking from Trappist, looks eerily like the same picture. It looks like the planet this false christ is on is Trappist that are both in the constellation Aquarius. So are these seven planets symbolic of the seven sisters entering Aquarius? Are the three habitable sisters, oops I meant planets, symbolic of these three witches that I have been talking about. Then you even have the three planets/bulls in Taurus that are three sisters that are three stars that are three rocks that are worshipped. Yeah, I wish I could make all of this up but my imagination isn’t that good. So I just told you what a Trappist actually was and “religiously” its from the Order of Cistercians of the Strict Observance (O.C.S.O. : Ordo Cisterciensis Strictioris Observantiae). This comes from there own website about the vows they take. “We take three vows, which have their source in the Rule of St. Benedict, written in the sixth century: A vow of Stability, promising to live the rest of our lives with one monastic community, A vow of Obedience to an abbot and a Vow of “Conversion of Manners”, the promise to live the monastic life in all its parts as described by the Rule of St. Benedict and the Constitutions of our Order. This last vow of “conversion” takes in the practice of celibacy, fasting, manual labor, separation from the world and silence.” (http://www.trappists.org/visitor-questions/do-trappist-monks-and-nuns-take-vow-silence). Stability, obedience and conversion. Sounds like the perfect vow. Maybe it should actually be the other way around? This celebration coincides with Beltan. Satanists view the 25 of February as a high holiday for all ages which involves blood sacrifices (http://www.theopenscroll.com/hosting/SatanicCalendar.htm). So Walpurgis if I can say, was the female version of a Trappist. NASA reveals this star with seven planets around it by the same name. And today isn’t Walpurgis day but that went stop these witches from celebrating in cursing Trump. Is all of this related in some strange occult way? Maybe Trump has become the new symbolic Macbeth?